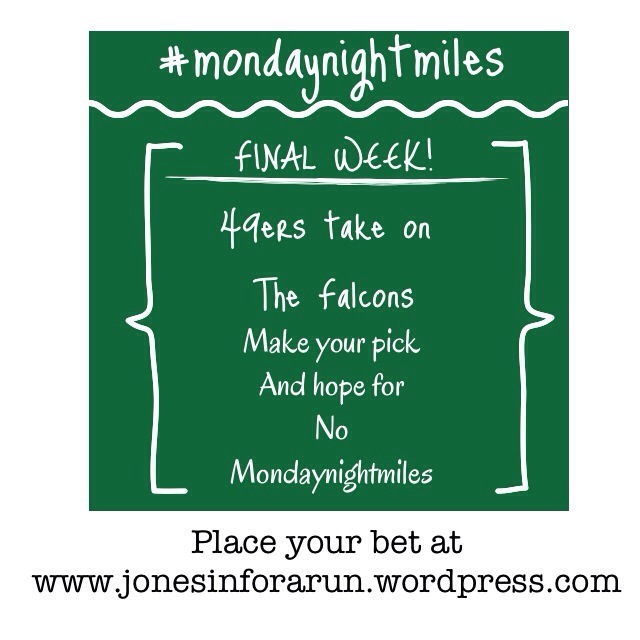 It’s hard to believe this week will be the last edition of my #mondaynightmiles running football challenge. I once again have to thank pavement runner for inspiring me to create this challenge- he hosts a playoff score differential running challenge! It was great fun last year- even though I never had to run any #milesofshame since I clearly picked the Ravens each time they played! I hope all that participated enjoyed the weekly fun and even logged a few extra miles if their team didn’t fair so well in their Monday night matchup. For the final week Atlanta plays the 49ers. I am picking the 49ers in honor of pavement runner himself. So for the last time in 2013- who are you betting on?! Next Post Meal Prep Monday!